Tory Niemann had not anticipated his game getting the crowdfunding treatment. "I was very wary about using crowdfunding, mostly because I had never crowdfunded anything before, or backed anything. I didn't know what to expect," told Niemann. In his eyes, the few game projects to date had been of very niche interest, and a $5,000 goal was especially lofty for a board game. "I was pretty uncertain about it, but David MacKenzie really wanted to do it. He saw the direction things were going, and it all worked out," admitted Niemann. Like most good gaming stories, this one has its fair share of luck. The decision to launch a Kickstarter project actually came rather late in the game design process. According to David MacKenzie, "It was very near the end. We were ready to publish it, and were already working with the artist to get the artwork done." But what makes Alien Frontiers so special, given that the bar for success was so low relative to today's standards? The answer is in how Clever Mojo Games conducted its Kickstarter campaign, acting in ways that would appear to be common sense today, but were quite novel four years ago. Kickstarter provided the tools, but Clever Mojo was first to master the technique. David and Tory were not shy about building hype prior for Alien Frontiers prior to launching its Kickstarter campaign. "We tested Alien Frontiers for a full year, playing it 2-3 times a week, and I would often go on BGG to post photographs and ideas about the game development," told David MacKenzie. This was not a surprise launch of a half-baked game design, and David was making sure that his audience knew. "I was very open about what we were doing, and it built up a community in advance." As the project progressed, David provided frequent updates, as often as twice per day, which was unheard of at the time. Crowdfunding would later become known as a practice that allowed backers to develop a personal stake in the projects they help fund, but Alien Frontiers was one of the first gaming projects to actually deliver on this sense of engagement. After Alien Frontiers arrived at stores, its initial 1,000-copy print run soon sold out, leaving gamers begging for more. All of the hype and support that had built up around the game manifested in one of Kickstarter's keys to success: the fear of missing out. Alien Frontiers quickly began selling for well above its original asking price on secondary venues such as eBay and the BGG marketplace. The secret was out, and gamers wanted in. With some positive hindsight, Tory Niemann has definitely warmed up to the use of crowdfunding, as he is proud of the legacy his game has left. "Alien Frontiers proved that game crowdfunding could be done in a really big way. After Alien Frontiers did it, everyone said 'it does work, so why don't we try it? It proved that (Kickstarter) was a viable funding option for people who wouldn't be able to bring their game to market otherwise." 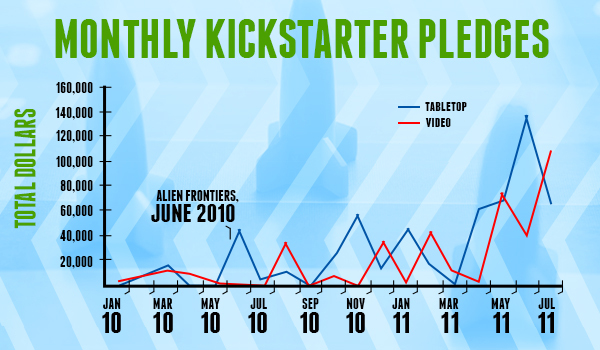 It is also worth noting how far into development the Alien Frontiers product was when its Kickstarter campaign launched. Video games had not yet seriously explored crowdfunding (it would be nearly two years before Double Fine provided the video game industry with its break-out moment), and tabletop games were a much safer bet. Gamers got their copies of Alien Frontiers quickly, and given the open nature of its playtesting, they knew that they were getting a quality product before ever committing a cent. It was the perfect jumping off point to convince gamers of crowdfunding's potential. The impact in Alien Frontier's wake was massive. Tabletop crowdfunding projects were easy to scope, given that publishers only needed to cover a game's factory production and shipping costs. Crowdfunding also provided more benefit that just some quick cash: established publishers knew they could use such a large source of pre-order data to more accurately size print runs to accommodate follow-on sales. Once publishers saw the potential for intelligent risk-taking, there was no turning back.